The other day's post about the mug rug I made for my mother-in-law's upcoming 81st birthday also spoke about what she enjoys most in a 'gift' from me.... that comes in the form of homemade goodies full of chocolate and sugar goodness frozen in single size servings that make it easy for her to pull out of her freezer to enjoy when she wants. I thought I'd share with you a few of the goodies I've made so far. 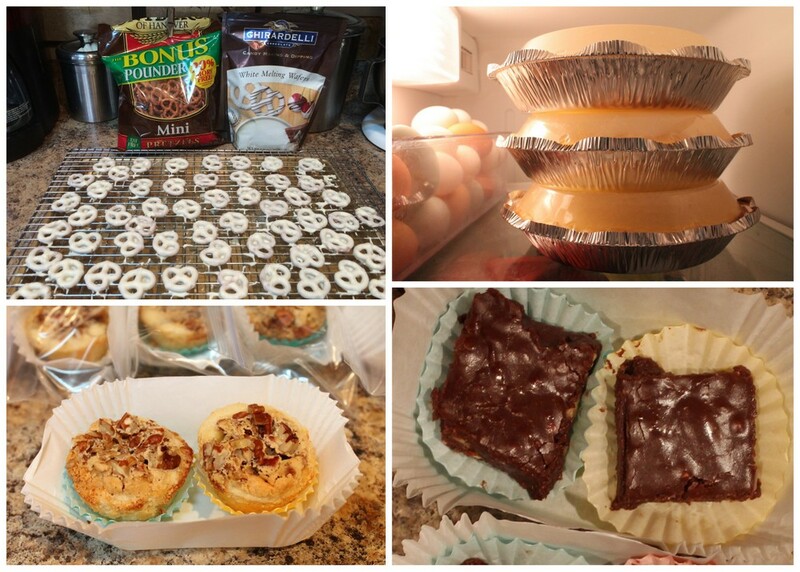 We begin with white chocolate covered pretzels, (so easy to do with your microwave! ), Philly 3-step Cheesecake, Pecan Tassies and 'Easy' Chocolate Fudge. All freeze well. The 3 cheesecakes did not make it through the weekend though, we're down to 2 today! What can I say! We love cheesecake here! The remaining two will be cut into slices and frozen this afternoon. With the pecan tassies and fudge, I used different size muffin papers to keep the goodies separate, and look nice too, before bagging them in a small freezer bag. The smaller freezer bags are then put into a larger freezer bag and the double-bagging helps keep the goodies fresher in the freezer longer. The cheesecake slices will be wrapped in wax paper before individually bagging, then bagging as a group. Tomorrow will be baking her birthday cake - Hershey's Perfectly Chocolate Chocolate Cake iced with Hershey's Perfectly Chocolate Chocolate Icing, then on to the Lowcountry for the birthday girl to blow out her candles and see her face light up as she checks each goody with delight before placing them in her freezer! Like watching a kid in a candy store! Such fun! These look like wicked things to eat:). What a good idea making small serves to freeze - it is so overwhelming when you are presented with a large cake. Sometimes I do the same (only I don't cook) buy something, and cut it into small pieces for when I feel like it. How nice of you to make something special for her - this will make a very happy day for her (and that means for you too, I suspect). Yes! The freezing in serving sizes works very well. My mother-in-law does not cook anymore, so this is how she gets the flavor from home whenever she wants! Thank you Sarah Liz!